Recently, I attended the Mozilla Festival, an event bringing together coders, teachers, and activists, to talk about new digital trends and solve problems. There, I met Laura Hilliger, who works with Mozilla Foundation on curriculum development, among other things. I found her in the middle of “makerfest”; a room full of people putting together new ideas. In this email interview, Laura explains some of her techniques to best organise people to come up with the best ideas, along with some of the current Mozilla Foundation projects. At the festival, you were organising people into “scrums”. What is this technique – and why do you use it? A “Scrum” is a long utilized methodology in software development. Tasks are broken into a series of subtasks and posted on a wall or whiteboard or in a collaborative environment. Then a group of people work through the tasks. The idea is that people can work on various parts of a project in non-sequential order. It's designed to be iterative and flexible and give the people working together both autonomy and insight – they can work on individual tasks, but also see what others are working on, understand contingencies, see group progress… I liked the method because it worked on a small scale – we were highly productive and used our time together wisely. I had never tried it [before] at as large of a scale as the Mozilla Festival. It was a big risk, and I was pretty nervous about whether or not it would work. It did, and not because the tasks got done, but because it created an atmosphere for peer-to-peer learning and collaboration. What came out of the Mozilla makerfest that you think might be useful to a global audience? Translation as a way to share resources was a talked-about topic at Mozilla this year. Did you work on this topic on the maker floor? Yes. We had a scrum category called “Empowering Diverse Audiences” where we had a subgroup of people leading the scrums around localization. Our interest is both around translation and cultural relevance. All around the world people are starting to use Webmaker as a toolkit for creativity as well as spreading digital and web literacy. It's much easier for technologists and educators in non-English speaking countries to teach the web if our tools and content are in their own language. So we've set up infrastructures and methods that help people translate and localize everything that Webmaker has to offer – from our tools and interfaces to webpages, learning content or support articles. At the Festival, we made big strides in certain interface translations, as well as with localized content. We'd love for people to help with translation as well as making culturally relevant content! 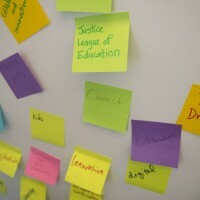 What is the impetus behind #teachtheweb, Mozilla's project to spread web literacy? Community. Plain and simple. There is a community of people who belong to web culture and want to help others be part of it too. We, the community, teach the web to people around us – our friends, family, our local communities – and then share what we've done with the global community in an effort to learn and grow together. I don't think #teachtheweb is about learning to code. It's about understanding that the web is a global knowledge ecosystem. There are emergent cultures within that ecosystem (including open sourcism), and these cultures are not tied to location or even language. An educational theorist & linguist, Wilhelm von Humboldt, said that when you learn a new language, your perspective changes. It's because your language and cultural background are related. You can only begin to understand a culture by learning it's language. #teachtheweb is about learning the language of the web, not necessarily coding languages, but the cultural languages – part of that is technical, but most of it is not. It's about developing adequate technical and social skills (and perspectives) to truly participate in civic life as our lives are moving more and more into a digital space. What would you suggest to teachers working in countries that have low internet penetration and slow connectivity – is it still worthwhile to learn how to code and how to understand the Web? Yes, it is worth it. The Web isn't going anywhere and the places in the world with low internet penetration and/or slow connectivity will not be that way forever. Also, all of this is about being participatory and responsible citizens, becoming educated – it's not just about the technical infrastructure of the web. It's about *education*. Understanding the Web (and web culture) is a part of being educated. Klafki (another educational theorist) said you are educated when you can think critically about key problems that affect the global community. The Web holds (most of) the world's information and humanity's knowledge. It gives us an infrastructure to consider problems and to help solve them but only if we have the competencies and skills to do so. Learn more about Mozilla webmaker projects on their website, where you'll find loads of projects to try out and lots of tools that will help you learn (or teach!) how the web works. You can follow their work on twitter – just search for #teachtheweb.